Three models are available driving 5 A (TC5 LAB), 10 A (TC10 LAB) maximum with 15 V compliance, or 15 A (TC15 LAB) maximum with 20 V compliance to the thermoelectric or resistive heater. Safety features protect the thermoelectric [TE] and it’s load. Over and under temperature limits as well as positive and negative current limits can be set. If the sensor signal is lost or a short is detected at the TE, output current is disabled. If temperature limits are exceeded, a signal to the active load can be sent to disable its current. For example, connect the LD Shutdown BNC output to the Active Lock input on Wavelength’s QCL LAB driver and the QCL current will shut down if temperature limits are exceeded. An Auxiliary Sensor can be used to monitor the temperature of the system heatsink. With Wavelength’s plug and play instrument, you have the ability to quickly set the controls using either the instrument touch screen or a remote computer, and results are easy to monitor. This allows taking your temperature controlled application from the test bench to market quickly and efficiently. One mating DB 15+2 Thermoelectric and sensor plug is included with the instrument. Single and dual rack mount kits are available. A DB9 mating connector for Status/Enable signals is available (CKT-203). A DB15+2 male connector with hood and high current pin inserts is available (CKT-204). Full cables for the DB9 and DB15+2 are available as WCB405 and WCB406, respectively. 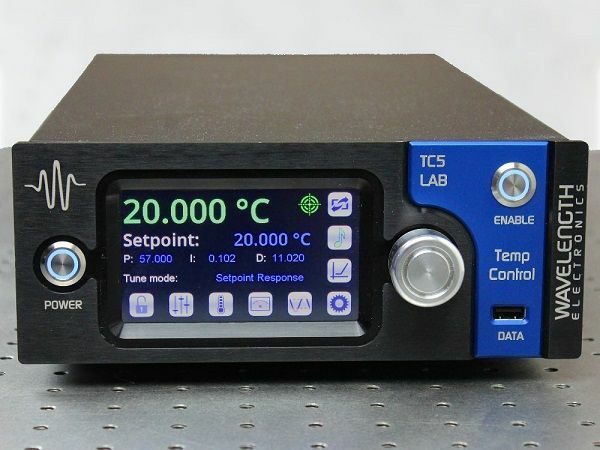 The ultra-stable temperature controller instruments are particularly reliable for research in electro-optical, medical, spectroscopy, and defense systems wherever precision temperature control is required.